Ivoire. It is thename I have given to a dream. 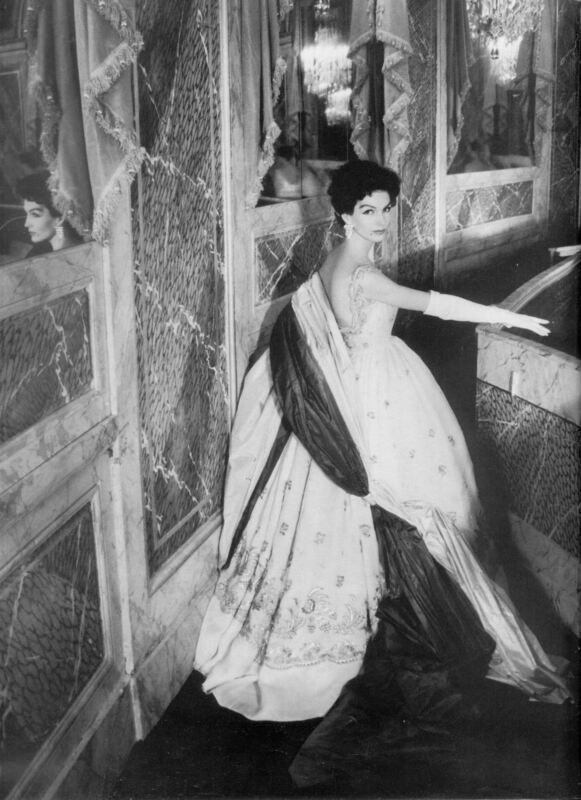 The name of a woman of cool slender beauty draped in pale silk, whom I saw for only an instant descend lightly the stairs of the Opera, and disappear into the night. Ivoire is the glow of this fleeting vision, which struck me with the force of a revelation. There will always be a mystery about Ivoire. An unfinished story. The feeling there is another world to know...emotion to touch...feeling beyond the civilized. And so it came to be. Inspired by her. Ivoire is a tribute to beauty and to woman. Cool and savage as ivory itself. I dedicate this perfume to all those women in the world who understand the dream of Ivoire so very well. So very French, isn't it? 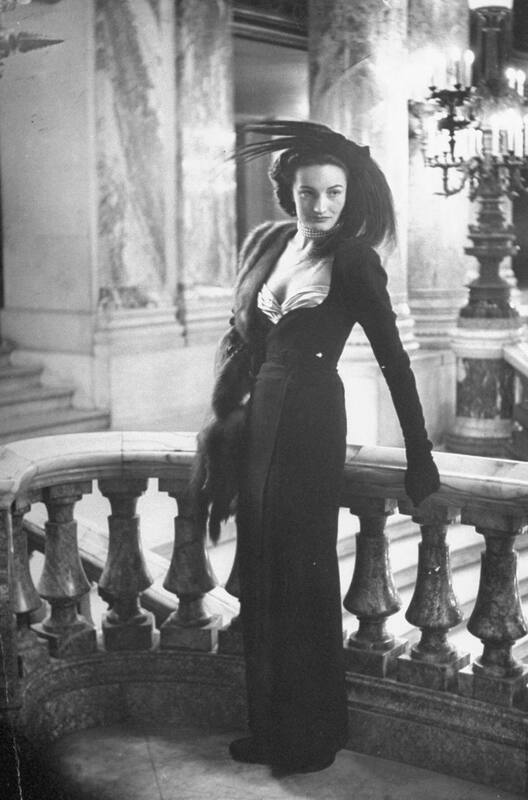 Ivoire was launched in 1979 or 1980 (various sources), a couple of years before Pierre Balmain's 1982 death. Leafing through beautiful photographs of Balmain's work throughout the years, it's pretty clear where the dream inspiring Ivoire originated. It's the (perceived) sophistication and romance of the past. And, indeed, Ivoire is much related to Balmain perfumes of the past and even to the green chypres of the 70, and not a harbinger of the 1980s power orientals. I have a couple of oldish and older bottles of the parfum and also a newer decant of the EDT. In all of them, Ivoire opens up relatively mellow and floral, quite soapy and very crisp. And, yes, it's a French girl in a spring dress and a vintage scarf. I like it well enough even then, but then things like carnation and galbanum happen. Together. At the same time. Ivoire becomes a lot more bitter green and in today's standards quite edgy. 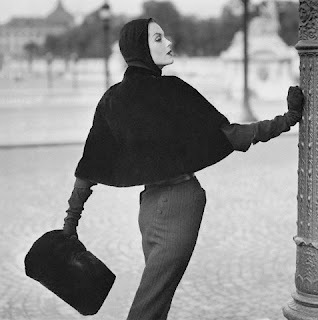 Pierre Balmain dreamed Ivoire with evening gowns in mind, but the quiet elegance and mellow soapiness make the perfume just as wearable with a business suit or riding boots. I think of it as an introvert cousin of Chanel no. 19 especially in vintage EDT and parfum, with parts that are closer to the EDP on its sweeter floral notes (I love all of them). I think a man could just as easily wear Ivoire today, especially considering the classic vetiver-patchouli-oakmoss dry-down. It's dry, dark green and very satisfying to fan of this style. Notes (from Balmain website): Mandarin, Bergamot, Galbanum, Rose, Jasmine, Ylang Ylang, Iris, Lily, Carnation, pepper, nutmeg, raspberry, Vetiver, Patchouli, Oakmoss, Sandalwood, Ladbanum, Tonka Bean. Ivoire is still in production but you can bet your perfume collection that the formula has changed as a result of IFRA regulations and commercial considerations. However, I don't know what the most current version of the EDT (78.00 €, 100 ml) smells like. I saw it last time I was in Paris in many stores, but here in the US most Balmain perfumes can only be purchased through online discounters. The good news is that the prices are far below $40. The even better news is that from what I can tell from the company's website the current formula only comes in the 100 ml (3.4 oz) bottles, so there's a good chance that many 1.7 and 1 oz bottles are older stock and might be true to the original. 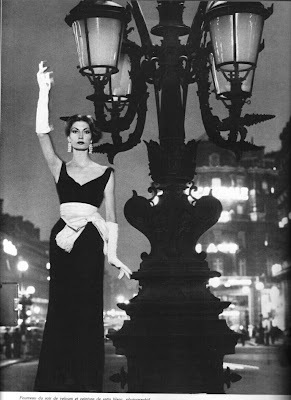 Fashion photographs of Pierre Balmain's 1950s creations from Dovima_is_Divine_II on Flickr. I remember trying and liking Ivoire upon its release. Then I bought a small bottle a couple of years back in my early perfumista days. Mellow and floral NOT - the opening notes of that thing sheared off my nose hairs like a buzz saw. It dried down to insecticide. Actually, Deep Woods Off has a more pleasant scent. Ivoire gets so much love in the blogs that I wondered what they were going on about. So it probably has been reformulated/cheapened. If I ever do run across a vintage bottle, I'll take a sniff, but I won't go out of my way as it left me kind of scared. The only fragrance I've actually thrown out. 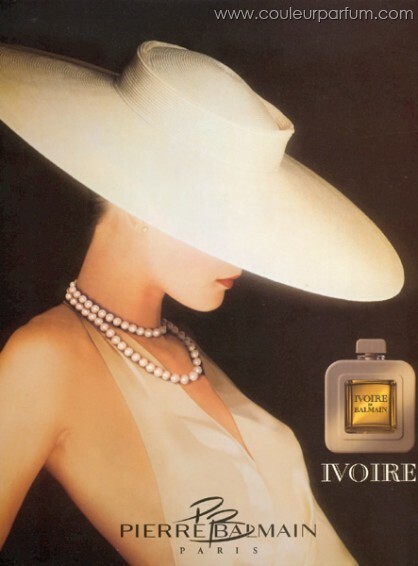 Ivoire was my first grownup perfume,which my father bought for me on a trip to Europe in 1980. I loved it and used every drop, though I can barely remember what it smelled like. Funny that you compared the original to Chanel no. 19, because that is the next fragrance I bought, and it was my signature scent for almost 20 years. My best girlfriend just gifted me a big bottle of Ivoire she's had forever and not used. It's not reformulated juice pure and splendidly origional!!! I had Ivoire over 30 years ago and always loved it....just forgot about it during the tidal wave of fragrances and flankers over the years. I'm in olfactory Ivoire heaven once again. My best girlfriend just gifted me a huge bottle of Ivoire EDP she had languishing in her home. She didn't use it and when she offered it to me, I jumped since I knew it was the original formulation, not some new-fangled interpretation of the juice. Over 30 years ago I used Ivoire, my mother's, and loved it. Then the tsunami of perfume introductions, flankers, etc. made me forget about Ivoire. I am in heaven once again, in love!! Vent Vert was also one of my all time favs not just the scent but because in one of the James Bond novels, one of his babes wore it. Of course 007 could identify it!!! !